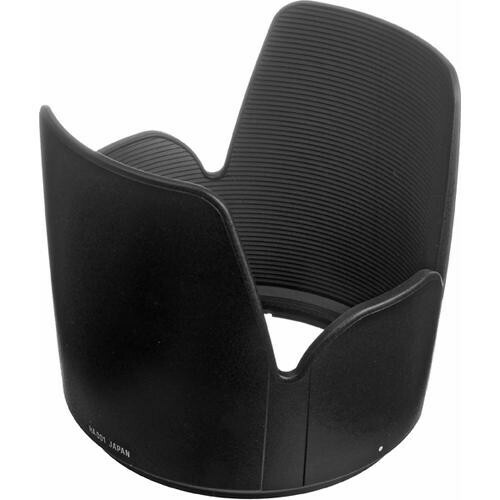 This plastic bayonet lens hood is the hood which is originally supplied by Tamron with the #A001 SP 70-200mm f/2.8 Di and VC lenses, and is offered here as a replacement for a lost or damaged hood. Box Dimensions (LxWxH) 5.4 x 4.5 x 4.2"
Lens Hood for the SP 70-200mm f/2.8 Di and VC Lenses is rated 4.9 out of 5 by 25. Rated 5 out of 5 by joatmom from Perfect hood for the perfect lens. I'm hooked on the Tamron lenses, bought an open box lens, new no damage, missing hood. searched multiple sites, B&H had the original Tamron hood (perfect fit) at a price that made it a better deal than a cheaper knockoff which aren't made to fit the same anyway, believe me i looked. Thanks B&H. Rated 5 out of 5 by Grampapip from Original Part Replacement I purchased a used lens and the lens hood that came with it was worn and loose. B&H had an exact replacement and it works perfectly. Rated 5 out of 5 by Anonymous from I would buy this product again and again Replaced a lenshood that I misplaced. I use B&H quite often and have made several purchases without any disappointments. Rated 4 out of 5 by Fred from Not for the SP 70-200mm f/2.8 Di VC USD G2 Model Since this was the only replacement hood on B&H for the Tamron 70-200 and called out Di & VC lenses I thought it would work. Unfortunately it does not work with the G2 model. The G2 Model replacement mfgr p/N is: HA025. As for the Hood, it seems solid and is actually thicker than my G2 hood that cracked when I got knocked by another photographer at sporting event. Wish Tamron had made the G2 hood with the same quality as this one. Rated 5 out of 5 by Sheri J. from Identical replacement, just what I neede It finally happened, I had my camera and lens fall to the ground, the great part was I think most of the impact to the lens happened to be absorbed by the lens hood, but in the process it cracked... SO I needed a replacement hood which is why I ordered this. I can't imagine shooting without it. It is exactly the same lens hood that came with my lens when it was new. Rated 5 out of 5 by Rosemary from Great purchase ... A few weeks back I realized what I had feared the most, that I had left my lens hood to my 70-200mm lens somewhere ... so I looked at B&H & they had the hood for the right price - bought it and it fits like a dream!! I'm very happy with my purchase & will be keeping better track of my hood in the future! Rated 5 out of 5 by Anonymous from Solid and great quality I bought this hood for my Tamron 70-200 f2.8 which I bought as used. Hood is like the lens which is cheap and great quality. It fit the lens tightly. It is much better hood than the one on my Nikon 28-300mm VR lens, although it is much cheaper. I have not noticed any thing bad about it. Rated 5 out of 5 by TRJPhoto from Great Hood to Minimize Flare A proper fitting lens hood is a must to shade the lens against flare and protect the lens from impact and scratches. I use this hood indoors and out any time I shoot with my Tamron 70-200mm f2.8 lens. what diameter is this hood?need to know so i can purchase the correct dimension lens hoodie. The lens hood is 4.25 inches in diameter. Yes it is! Fits like the original! Will this hood fit the newer 70-200 Di G2 model? I bought mine to fit a Tamron 70-200 F/2.8 (IF) Macro @77 lens and it works fine for me. I don't know if that answers Joe's question. Does it fit on 70-200mm no VC? This Tamron lens hood will be compatible with the non VC Tamron 70-200mm f/2.8 lens, yes.